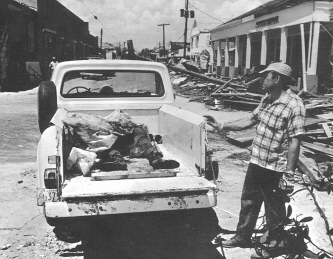 1969 Population: 240,000 in South Mississippi when Camille hit. A small tropical wave exited the continent of Africa on August 5th, 1969. The wave was poorly organized and presented little threat to any land masses. On August 9th, the wave, which developed into a V-shape, was recognized as a tropical disturbance, but still presented little threat to any land masses. Once this disturbance entered the Caribbean, though, it showed signs of increased curvature and banding. Camille's intensification occurred mainly in the Caribbean, south of the islands of Cuba and HispaZola. 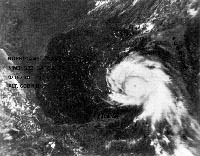 Camille made landfall for the first time as a hurricane on the 15th of August, striking the western tip of Cuba. The storm dumped 10 inches of rain and reportedly killed only 3 people. It was after the first landfall that Camille reached the warm Gulf of Mexico. August 17th was finally marked with hurricane warnings that stretched along the Gulf Coast. Camille lay only 250 miles off Mobile, Alabama. The eye-wall winds were in excess of 200 miles per hour, and although hurricane-force winds extended a mere 60 miles from the center, Camille was at its intensity peak. Many forecasters expected the storm to strike the panhandle of Florida, however Camille struck over 100 miles west of the predicted area. Camille made landfall at 10:30 p.m. on August 17th along the Mississippi coast dead center of the Bay of St. Louis. 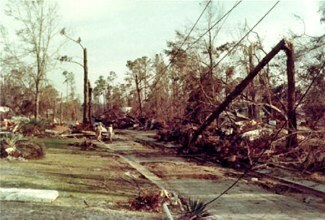 Camille's winds at landfall were estimated as higher than 200 miles per hour. Those who had ventured out --- described the night as having lost its darkness. And others recalled that the sky was filled with light from a cascade of lightning that lit up the horizon and made everything visible. Then, a hurtling mass of water came crashing, with rolling breakers swirling on top. It was so mammoth that many buildings and houses were instantly smashed to pieces. A solid wall of water advanced over the ridge and over Beach Boulevard in Pass Christian, crashing down the hill past Second Street, and continued on pressing over the railroad tracks – rolling northward toward Bayou Portage. Then a second rush of water bombarded and covered the Town almost in its entirety. As a further peril, waters were rising out from the bayous and backed up to meet the Gulf tidal waters. This caused extensive street flooding that ranged between 5 to 15-feet-deep, depending on what part of Town it settled in. Automobiles were submerged causing emergency vehicles to be rendered useless. Down the center of the Bay of St. Louis pressed Camille's monstrous 5-mile-wide "eye" – The Pass was positioned at the eye's right-front quadrant – the worst place to be when hit by such a storm. Those in the Pass, in remembering the storm night, recall no break in the storm winds – as the eye was veering off just west of the town. As the evening proceeded, the hurtling winds picked up in excess of 200 mph. There were many valiant deeds performed that night by Civil Defense personnel, law enforcement officers, firemen, military personnel and local civilians in safeguarding others that were found in distress. Screams for assistance were answered with daring rescues – while other screams were quieted by the clamoring roar of the winds, not ever to be heard again. Many pleas for help, went unanswered because the would-be saviors could not locate the source of the appeals for help. Some residents were trapped and would not leave their “safe haven” in fear of losing their lives out-of-doors.. Many hundreds of "Pass" residents spent the most terrifying night of their lives not knowing just how much longer they could hold on. Many of them had ample time to reflect the wisdom of their decision in staying with their homes, rather than seeking safety elsewhere. Facing the hazards of the evening, resulted in a number of ill-fated accounts which have been retold over and over again. Some exaggerated, some misleading and some that resulted in unwarranted fatalities. Thousands of lives were saved across Coast by round the clock Military efforts. The Eighth Coast Guard District started early with a busy day. On Sunday afternoon, helicopter crews had saved 30 construction workers stranded on an offshore platform in Lake Charles. The rescues were described as "harrowing." Coast Guardsmen evacuated the more serious patients from the hospital at Bay St. Louis as rising waters surrounded the complex. During the rescue missions, the Guard lost its stations in Gulfport and at Pascagoula in addition to more than $1 million in equipment. Still, they went out on rescues, inspiring President Richard Nixon to write that they had "responded to the extraordinary challenges of Camille with both courage and resourcefulness." Some of the weekend soldiers who unwittingly found themselves on the Coast for Camille received commendations and medals for heroism. Some were Guardsmen who countered-manned their orders when told to take shelter – instead – they continued to seek out and carry Camille victims to safety. They were sent out on patrol in aiding the evacuation process to local Civil Defense designated shelters. There were many who refused to bide the instructions. In those cases an exasperated National Guardsman was reported to say more than once, "If you will not go, give me the names of your next of kin so they can claim your bodies," In the wee hours of Monday morning, in the height of Camille's fury, National Guardsmen here on their regular weekend-warrior routine set out in amphibious vehicles to pluck more than a 1,000 soaked, battered victims from trees, roof tops and utility poles. But they could not rescue them all. As the picture unfolded, those who were rescued were indeed lucky. Hundreds and hundreds of others near water had to fend for themselves, retreating to attics and rooftops, grabbing onto floating trees, dodging debris as dangerous as bullets. As the night drew to a close, the water started receding. People began assisting others in need. Well before daylight more and more people began moving about, almost totally on foot, because vehicles had been under water and would not operate. The streets were blocked with debris and fallen trees. Then came the dawn.
. . . And all the people gathered themselves as one man into the street that was before the watergate . . . The day following Camille was Monday, the 18th of August. Many families were found dazed and in shock. Yards were strewn with debris as those who persevered looked with incredulity at their damaged homes. Others were found standing on fractured sidewalks stirred by untested emotions as they stared with disbelief at their demolished dwellings. From prior storm experiences, they had come to believe their homes were well fortified from rising water. There were few buildings left standing whole. Wreckage was scattered in piles that were as much as 25-to-50 feet-wide and 10-to-15 feet-high, which stood as reminders of the high tidal marking for the Second Street area. Of those buildings flanking east and west and to the south of it, only the old City Hall remained – except for one of its stalwart columns having shifted, it was left structurally intact. The area from Second Street to the beaches was a picture of complete desolation – as also were the low lying areas of western Pass Christian. Survivors from the previous evening were trying to salvage what they could from their homes. A house had been torn loose from the rising waters and was dropped on top of an automobile. Some reported to each other that the water had risen less than a foot from the peak of their roof tops. Individuals reported how the storm had picked up some houses and lifted them over fences and deposited them yards away, yet leaving the picket fences untouched that surrounded the former house sites. Streets were clogged with tumbled homes, automobiles and furniture prohibiting automobile traffic. Friends and relatives who arrived from inland towns found that most streets were impassable. They were able to get some idea of the force of the wind and the height of the water. It seemed impossible that anyone could have lived through such tremendous destruction. All along the front towards the Gulf, the hurricane's full force had wreaked havoc. Stately mansions were gutted and many were mere shells that later had to be torn down. Everywhere – the ground was littered with trees that had been ripped out with their roots attached. The growl of power saws cutting into branches and lumber sounded above the rumble of dump trucks that began hauling away the wreckage in clearing a path along Hwy. 90. The South Mississippi area that suffered most was Pass Christian. Every structure in the "Pass” was damaged by the storm. Pass Christian's Scenic Drive was anything but scenic. Rubble from houses and the harbor, along with cars, made the once-scenic drive impassable. Never before had a storm so totally and indisputably devastated such a large area. With an estimated population of 3,600 in Pass Christian, barely a home was left untouched. There were no longer any beach front landmarks on Hwy. 90 with the exception of an occasional shelled structure or leaning steel beam with a portion of the sign it once held erect. 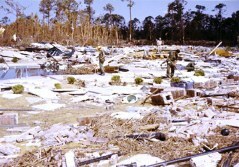 Debris of all kinds, including wood, steel, rest room facilities, washers, dryers, air conditioners and other materials were scattered over the entire area. In some areas the debris was stacked up 30 feet high against the rising land from the beach front. Miles and miles of twisted and felled trees were found everywhere. All that was left along the beach front to Bayou Portage was the courage of the people whose homes and businesses were destroyed. Initial recovery started with the survivors trying to do for themselves. They attempted to clear pathways through the major streets. An early morning ride from Gulfport to Pass Christian took more than three hours. At the west end of Pass Christian families were found outside their residences with mud almost a foot thick flowing off porches and out doorways. Many families recovered brooms, mops and stray pieces of lumber to scrape out the debris. Mattresses, bedding and other items were being hung across downed trees for airing and drying. The end of the first day impacted more than physical exhaustion. Emotional trauma began to influence their behavior. There was no electricity, no water, no telephones, no newspaper deliveries, and thus, no way to communicate with the rest of the world. 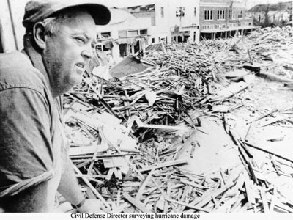 The first Rescue Teams consisted of local citizens and the small local police force and the Volunteer Fire Department joining with the few members of the City's Civil Defense. However, they were soon joined by Seabees and the Mississippi National Guard. Needless to say, lines of command and authority became a problem in reclaiming and identifying the recovery of deceased bodies. The first bodies found were hauled to the Fire Station, which was located at Second Street. As more and more bodies were discovered, they were then moved to the old City Hall, then located at Market Street and Scenic Drive. As time passed on and the heat settled in, the bodies presented a health and odor problem. 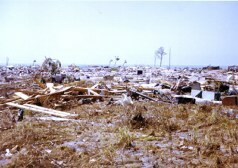 Bodies, many of children who could not hang onto trees after their homes were leveled by winds in excess of 200 mph, were still being found days after the brutal storm. Body identification was slow, notification to next of kin was even more difficult and the list of missing and unaccounted for persons was growing longer. The only cold storage facility available was the Ice House, which was impressed into being a temporary morgue while identification and burials were being prepared. During the cleanup in the first few weeks, bodies continued to be found in different parts of town. The stench of death was everywhere in Pass Christian. As more bodies were found, they were eventually transported to Gulfport Funeral Home facilities. Early identification became hindered by the fact that so many local residents had been evacuated. Another problem occurred involving bodies that were mistaken for hurricane victims. It turned out that there were some remains from recently buried that had been washed up from the local Pass Christian cemeteries. The continued search for bodies was aided by 15 Ft. Benning, Georgia, soldiers who brought in specially trained German Shepherd scout dogs for search and rescue duty in Vietnam. At that time, there was no way to know how many bodies were buried beneath the rubble, so it was felt that the dogs were necessary. This was the first time such an effort was tried in a public calamity. 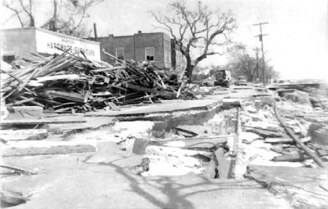 Eventually, seventy-five local residents were identified as having been killed either during the storm or who had succumbed due to injuries received during Camille's winds, accompanying tornados, and the huge tidal wave that crushed everything in its path. Additionally, their were three female bodies that were found near the beach area of Pass Christian --- that were later named “Faith, Hope, and Charity” by Harrison County Civil Defense Director Wade Guice. The killer storm took the lives of more people from the "Pass" than any other coastal community.